We Stop Premature Pin and Bushing Failure. Did you know that one of the biggest reasons for pin and bushing failure is because the end user is not using the correct grease. Often, the customer is not only using the wrong grease but they are also spending to much money. 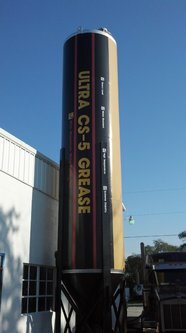 ULTRA CS5 GREASE is an affordable grease and often cheaper than what some customers are already paying. We have a formula of calcium sulfonate thickener, XHD base stock oil and additives mixed with MOLY that is recommended by some of the largest equipment manufactures in the world. Learn on our website why using MOLY is the first step in protecting your pins and bushings. Contains 5% moly to minimize wear on heavy duty construction equipment. Meets or exceeds the requirements for Caterpillar MPGM, John Deere , FMC,and Mack FG-C. Exceptional performance for ball joints and pin and bushing applications. Recommended where high temperature and water contamination may be a concern. Will not soften when introduced to water. Superior load carrying Capabilities. For use in heavy equipment, on and off road trucks, agriculture and mining equipment.